Can we use the CT template also for SME instrument phase 2 submissions? The template 'Essential information to be provided for clinical trials…’ mentions Horizon 2020 single-stage and stage-2 topics for which it is mandatory to complete the template. For respective topics you will have the possibility to upload the completed template as a separate part of your application in the submission system. For all other topics - if a proposal contains a clinical study - you are welcome (but not obliged) to use the structure provided in the template (or an adapted version) and integrate this information in section 1.3 (‘Concept and approach’) or in the relevant work package in section 3.1 (‘Work plan – Work packages, deliverables and milestones’) of part B of the proposal. If required, the table provided in section 1.9 of this template on unit costs can in this case be provided in section 3.4 (‘Resources to be committed’) of part B of the proposal. Can you please give an example of technical personnel that can be included in the calculations for the Unit costs? In a first step categorize the personnel available within your institution into the three personnel categories (doctors, other medical personnel, technical personnel). There is no fixed rule which personnel are to be allocated to which category. The category ‘technical personnel’ is to be understood as a broad category. However, the information given in the employment contract should be in line with the category the personnel are aligned to. The assignment of the personnel to the three categories should be the same for all subsequent applications which will provide a sound basis of personnel allocation to the three categories for the auditor. How detailed does the Ethics section need to be for an observational trial? The understanding of ethical concerns should clearly emerge from the proposal. Please check which ethics issues in the ethics issues table (part A/proposal submission form) apply for the activities envisaged in your proposal. The information that needs to be provided in proposal section 5.1 (part B) depends on the ethics issues ticked. The EC guide ‘How to complete your ethics self-assessment’ will exactly guide you through the points to be discussed in proposal section 5.1 for each ethics issue. At what stage of proposal submission/implementation is it necessary to provide the protocol? Must all methodology be in the main body of the proposal or can some of it be in the clinical trial template and just referred to in the proposal? Must all methodology be in the main body of the proposal or can some of it be in the clinical trial template and just referred to in the proposal or should we assume the possibility that an evaluator will read the main proposal only? Each section of the clinical trial template must be shortly and concisely described. Information outside the scope of this template will not be taken in account for the proposal evaluation. No other chapters or annexes (containing e.g. complete study protocols) can be added to this template. Section headings should not be changed. In case one or more issues do not apply to a particular study, please briefly explain/ justify. Information provided in this template does not need to be repeated elsewhere in the proposal, but can be referred to. If your clinical trial is in year 5 of a complex 5-year project it's very difficult to fill in the clinical trial form - how do we cope with this when filling in the form? If your clinical trial is in year 5 of a complex 5-year project it's very difficult to fill in the clinical trial form as (by definition) we don't know exactly what the trial will be (depends on output of research in years 1-4) - how do we cope with this when filling in the form? When the requested information is currently not available (e.g. a clinical study is planned for a later stage of the project and will be based on data from prior studies) the source of required data should be provided and/or the selection of the applied methodology should be described. The full proposal must be consistent with the short outline proposal and may not differ substantially. Changes are not recommended, but if absolutely necessary, they should be clearly explained in the Proposal submission form, section ‘Declarations on stage-2 changes’. The evaluators will determine whether or not these changes are legitimate, and whether or not their insertion compromises the evaluator judgement made at stage 1. Are the costs reimbursed through the academic CRO (participating in the project as a beneficiary) or through us as a partner hosting the national ECRIN? If there is an academic CRO (ECRIN) participating in the project as a beneficiary and we as a national partner are both beneficiary and part of the national ECRIN, are the costs reimbursed through the academic CRO or through us as a partner hosting the national ECRIN? Each beneficiary should budget its own costs. Costs should be budgeted in line with the project activities each partner is involved in. In an EU funded clinical trial who is the sponsor? In the conduct of a clinical trial, a sponsor is an individual, institution, company or organization. Would it be possible to get an extension for your project due to e.g. changes in regulatory (EMA) guidance, which may cause a delay? Timely completion of projects is a declared goal under Horizon 2020. There is no flexibility regarding duration – project extensions can generally not be granted in Horizon 2020. Non-compliance with expected timelines and recruitment estimates (significantly delayed key study milestones) might lead to reduced EU contribution or the termination of the grant agreement. Upcoming challenges must be reported quickly and fully to the EC officers in charge. Exceptional project extensions are based on a case-by-case decision by the European Commission. How many (pre-clinical) efficacy and safety data needs to be presented under Heading 1.6? Section 1.6 of the template ‘Essential information to be provided for proposals including clinical trials...’ requests concise information on safety and tolerability of study interventions: e.g. pre-clinical data from in vitro or in vivo studies; data from previous clinical studies; data from (pharmaco)vigilance systems or other sources. Furthermore provide concise information on efficacy of study interventions based on (pre-)clinical data. I understand well that unit costs should be the same for all beneficiaries? The ESTIMATION OF RESOURCES (per task on the basis of the protocol) per clinical study subject is the same for all beneficiaries applying unit costs. However, each beneficiary calculates the costs based on its historical costs. Historical costs mean the costs from the last closed financial year at the time of submission of the proposal. Do you have any suggestions on SMEs that are currently preparing for the preclinical phase? HORIZON 2020 also supports preclinical activities. The scope section of each topic clearly describes the expected activities. In order to clarify content-related questions please seek advice e.g. from your National Contact Point. The combination of unit costs per patient and actual direct costs within one clinical study is possible. Exception: For the costs of personnel directly assigned to the conduct of a clinical study, each beneficiary or third party may only choose ONE OF THE FORMS (unit costs per patient or actual direct costs). However, this does not apply to personnel costs for horizontal tasks (e.g. study monitoring or coordination). Can CROs be a party making available resources against payment? In Horizon 2020 third parties (i.e. parties not signing the Grant Agreement) receiving payment can be involved as a contractor for other goods and services (Art. 10 MGA), subcontractor (Art. 13 MGA) or as third parties providing in-kind contributions against payment (Art. 11 MGA). Patient data, for example, can be considered as in-kind contribution. A requirement for ‘in-kind contribution against payment’ is a written agreement between the beneficiary and the third party prior to the start of the work. These third parties need to document their costs in the same way as beneficiaries (actual costs or unit costs). Wherever possible, third parties should be listed in section B4.2 of the full proposal. EDCTP aims to keep the Letter of Intent stage as simple as possible. At the second - full proposal – stage, the quality and efficiency of the implementation in addition to the Excellence and Impact criteria are evaluated. The application form will be equipped with upload functions where applicants can upload supporting documents such as charts. In general, if attachments are required for a specific section of the Letter of Intent or the full proposal, the form will have the necessary upload function, e.g. for the call 'Strategic actions supporting large-scale clinical trials', cofunding letters can be uploaded and attached to the Letter of Intent. During periodic reporting, who completes the financial statement of a linked 3rd party: The beneficiary or the linked 3rd party? The linked third parties may declare their costs (in their financial statements; see Article 20.3), if the eligibility conditions set out in Article 6.3 are fulfilled (e.g. actually incurred by the linked third party, necessary for the action, incurred during the action duration, etc.). The costs must be recorded in the accounts of the linked third party. -	Linked third parties may declare costs for all cost categories (as provided for in Article 5), including indirect costs (at the 25% flat rate). -	Each linked third party declares its own costs. The costs of the linked third party must not be included in the beneficiary’s financial statements. Each linked third party has its own financial statements, but these statements must be submitted by its beneficiary (since linked third parties cannot sign them in the IT system; see Article 20). For this purpose, linked third parties must send their signed financial statements on paper to their beneficiary. For two-stage evaluation proposals, is the total budget specified in the first stage binding for the second stage detailed budget? Yes. There should be no big deviations to the budget specified in the first stage. But you can make small corrections. Is there any possibility to apply for 2nd stage when we haven’t applied for the 1st stage of a 2-stage project? If you mean the second phase of the SME instrument: then yes. Otherwise: no. Is it possible to include professionals persons (holding TVA) within the personnel budget of the project as in-house-consultants? 1.2.1 What? This budget category covers typically the costs of in-house consultants and similar persons (i.e. self-employed natural persons) that worked on the action for the beneficiary under conditions similar to those of an employee, but under a contract which is NOT legally the same as for employees. It regards, in particular, contracts qualified as quasi-subordinate work contracts under national law when the conditions under which the work is carried out are similar to those of an employee. Are costs made before the start of the project related to the organisation of the kick-of-meeting or website eligible? No. The only costs eligible before project start are travel costs to the kick-of-meeting IF the travel itself took part within the project duration. What do you consider a department of an institution that issues invoices for the services provided to the other departments of the institute due to the accounting system of the organisation? What do you consider a department of an institution that issues invoices for the services provided to the other departments of the institute due to the accounting system of the organisation? Is it a third party? Since the price is charged by a different department of the same legal entity, this is considered internal invoicing. In the AMGA it states that in exceptional cases subcontracts are possible between beneficiaries and affiliates. Does this also apply to linked third parties (no affiliate, but legal link)? Does this rule also apply to contracts? Is subcontracting possible with the affiliates if they are a 3rd party in the contract through Art 14? The question is if a linked third party is also the usual provider for the use of equipment (but not the same general direction) is it possible to consider them as contractor. Hence, they will make an invoice to the R&D department of the Beneficiary. How can you distinct between subcontracts and cost for services as service contracts in research projects: are pure measures of scientific samples belonging to services (if not including scientific work) and in contrast is a R&D contract including research belonging to subcontract? How can you then proceed in a marginal case like blood measurements with a resulting standard analysis which later on will be scientifically evaluated and incorporated into the work action? A unit cost is a ‘fixed amount’ per unit which is charged instead of a price which has ‘actually incurred’ by the beneficiary. Regarding SME owners: SME owners not receiving a salary must declare their personnel costs on the basis of unit costs (an hourly rate fixed by the Commission). What happens in the case of third parties of third parties: sometimes Hospitals who are dependent on Health Services have third parties that control the budget of the proposal on a free of charge basis (clause 12). If an institution has the national service as third party that means that the entity is obliged to mention the Hospital foundation as a third party. In this case, how could the entity proceed? We understand you are referring to third parties of Linked Third Parties. Since Linked Third Parties are subject to the same conditions of eligibility as beneficiaries, they may also declare costs of in-kind contributions provided by third parties. The beneficiary will reimburse the actual direct costs. Concerning the reimbursement of the indirect cost two different cases my apply: either not taken into account if the in-kind contribution is used in the premises of the beneficiary or taken into account by using the 25% flat-rate if the in-kind contributions are used in the third party’s premises. In this case, the direct costs actually incurred by the third party may be increased by a flat-rate of 25% on those costs. For more details and examples see annotated Grant Agreement Article 11. What is the advantage/disadvantage to be involved as third party providing in-kind contribution over linked third-party? Is a third party ‘providing in kind contribution’ in contrast to a ‘linked third party’ never intended to be a research co-operation partner as the other contractual beneficiaries? Is a third party ‘providing in kind contribution’ in contrast to a ‘linked third party’ according to the existing definition in the AMGA never intended to be a research co-operation partner as the other contractual beneficiaries? By definition, a third party providing in-kind contributions does not perform any work in the project, so it does not play an active role in the project. Even if it seconds personnel to a beneficiary, this personnel works under the instructions of the beneficiary and not of the third party. In contrast, a Linked Third Party actively carries out work in the project. Do you need to provide timesheet for in kind contribution provided by third party free of charge? If the in-kind contribution is declared as a cost, it needs to be supported by evidence. Therefor, personnel provided as an in-kind contribution free of charge need to be supported by time records or a declaration on exclusive work on the action. If an in-kind contribution free of charge is also considered a receipt, which is the benefit of declaring those cost? A receipt does not necessarily lead to a reduction of the grant, but only if the receipt would produce a profit at the level of the consortium. Please see article 5.3 of the Grant Agreement for further information. If a PhD candidate works part-time for a beneficiary, in an in-kind contribution free of charge, does the beneficiary declare costs of in-kind contributions for this 10% work in "Other direct costs"? On the in-kind contribution without payment: if a PhD candidate works 10% of his time for a beneficiary, in an in-kind contribution free of charge, does the beneficiary declare costs of in-kind contributions for this 10% work in "Other direct costs"? If yes, how does the beneficiary give the corresponding funding to the university paying for the PhD candidate? Under the "financial support for third parties" section? ‘Financial support for third parties’ is an option which is not applicable in most grants; it has nothing to do with ‘in-kind contributions provided by third parties’. If the in-kind contribution is free of charge (or, as you write, ’without payment’), the university does NOT receive a payment for seconding the PhD candidate. If the university charges the beneficiary for providing the PhD candidate, this is considered an ‘in-kind-contribution against payment’. The beneficiary charges the costs it incurs under the category A.3 (costs of personnel seconded by a third party against payment) and reimburses the university. Are international experts on the Advisory Board Third parties providing in kind contributions? Can we pay them only travel and substance costs or also a fee (at actual costs)? No, they are not considered as in-kind contributions. If the experts are paid a fee, the relationship would usually be considered a contract or subcontract. (In the case of subcontracting) If the organization has not implemented any internal procurement procedure what rules should be applied? Beneficiaries must award the subcontracts ensuring best value for money or, if appropriate, the lowest price. The best value-for-money principle does not require competitive selection procedures in all cases. However, if a beneficiary did not request several offers, it must demonstrate how best value-for-money was ensured. For the best price-quality ratio, price is an essential aspect (together with quality criteria, such as technical quality, etc. ), but it is not automatically necessary to select the offer with the lowest price. In order to provide a good analysis of the price-quality ratio, the criteria defining ‘quality’ must be clear and coherent with the purposes of the action task that is subcontracted (AMGA, §13, S. 130-135). I would be more than grateful if you could bring more clarity on subcontractors participation in a clinical trial. I would be more than grateful if you could bring more clarity on subcontractors participation in a clinical trial. Is it fine to have a certain number of sub-contractors providing clinical recruitment and sample collection? It is OK to subcontract in general. But it depends on the nature of the tasks. Core tasks cannot be subcontracted, they have to be done by partners. Minor tasks can be subcontracted. If subcontracting, you have to do so via procurement according to your organization's rules. So you cannot name the organization which will be subcontracted in the application. How should the hospitals recruiting patients be included in the project? How should the hospitals recruiting patients be included in the project? As subcontractors, partners, service providers? Sometimes at the beginning of the project the list of the hospitals is not available or it is not possible to quantify how much budget they will need to manage the patients. In some case it is necessary to add additional hospitals during the project. The EC prefers to include study sites as partners. Other options are to subcontract the task (Attention: Only minor tasks can be subcontracted), to include them as In-kind contributions provided by Third Parties against payment or affiliated entitities and third parties with a legal link to a beneficiary. Please refer to slide 29 and 30 of the first presentation (webinar on 18.3.2015) for details. If you need to add study centers during the running project, it depends on how you have included them in your project. If you need additional partners, you have to file an amendment. If we have around 10 different recruiting centers, should we include them as beneficiaries or subcontractors? (i) As third parties providing in-kind contributions against payment (Art. 11 of the grant agreement). A requirement for this is a written agreement between the beneficiary and the third party prior to the start of the work. These third parties need to document their costs in the same way as beneficiaries (actual costs or unit costs). Wherever possible, third parties should be listed in section B4.2 of the full proposal. (ii) As subcontractors (Art. 13 of the grant agreement). In this case, the beneficiary needs to ensure that it complies with the obligation to ensure the best value for money and institutional rules for subcontracting and if the beneficiary is a public body, with national and EU legislation on public procurement. Subcontractors would not usually be named in a proposal given the necessity to undertake the processes required to ensure compliance with the conditions described above. If however such processes have been undertaken in advance, subcontractors may be named in a proposal. (iii) Another option, to participate as ‘linked beneficiary’, is limited to entities that fulfil the specific conditions of Art. 14 of the grant agreement on ‘affiliated entities and third parties with a legal link to a beneficiary’. As these conditions are rather specific, the use of this option is likely to be limited. We are a SME in Barcelona. We have experience in several FP7 projects, developing the recruitment database for patient’s data collection. I don't know where to find Institutions and other partners that can be interested in such a partnership. Does the rule of not subcontracting of core tasks also apply to PHC12, which is SME Instrument? A small biotech or IVD company might not have the capabilities to conduct the CT, so it must be obliged to subcontract them entirely. The clinical study partners should be partners= beneficiaries whenever possible, this is right; but in PHC12 only SME are eligible for funding. So you either can identify a for-profit CRO that is willing to act as beneficiary (as it is 100% funding rate this is not too bad), or they act as subcontractor. If you are or prefer working with non-profit CROs or with academic partners (university hospitals), they must be subcontracted for this topic. The commission is aware of the dilemma, but confident that the amount of subcontracting will not be a major hurdle for the applicants respectively the evaluation result. Note that in PHC12 like in any other SME instrument topic, the “impact” is even more important than in research & innovation actions, compared to “excellence”. This is: plan and write your project proposal in the best way for your company so that you will be able to become a champion in your market. Giving the fact any Horizon project involve a consortium maybe it will be useful that participants in this webinar share their email address and key interest for finding potential partners. Where do fees for ethical committees and insurance go in the budget? Fees for ethical committees will be other direct costs. Insurance costs can be part of the unit costs or other direct costs (when choosing actual costs). It was said that Evaluators / EC may object to fund Phase 3/4 trials due to high costs. What if the proposals apply for partial costs, for example only certain sites? Funding of Phase 3 or Phase 4 Trials depends on the topic. Some topics might even require later phases of trials as well. Generally, it is possible to claim partial costs. Just make sure to explain how you will cover the remaining costs that won’t be requested from the EC, so it will be clear to the reviewers that you will be able to conduct the CT properly. If you will apply only for partial costs of the study in the scope of the EU project, e.g. for certain study sites but will cover other sites by yourself, you will have to convince the reviewers that data of those sites not included in your project will still be obtained to ensure the feasibility of your project. Yes, costs of insurance can be part of the unit costs. For costs in different currencies (e.g. GBP) is their guidance on which exchange rate to use? Also can the exchange variations be managed? Yes, please see page 5 of the template. It states: Costs incurred in another currency shall be converted into Euro at the average of the daily exchange rates published in the C series of the Official Journal of the European Union, determined over the corresponding year N-1. If no daily Euro exchange rate is published in the Official Journal of the European Union for the currency in question, conversion shall be made at the average of the monthly accounting rates established by the Commisson and published on their website. Does the EU finance clinical trials other than medicines or devices? Depends on the topic. They also fund observational studies, if there is a respective topic for that. Do we understand correctly that it will be allowed that one beneficiary makes a choice for unit costs while other beneficiaries opt for actual costs. Yes that is correct. Each beneficiary can decide to be reimbursed on basis of unit costs or actual costs for a given clinical study. How can the unit costs be calculated to "be the same for all members of the consortium” as stated in 1.9 in the template for clinical trials? In a clinical study involving different countries with very different actual cost levels, (personnel costs of doctors, other medical personnel and technical personnel) e.g. one very high, one very low, how can the unit costs be calculated to "be the same for all members of the consortium” as stated in 1.9 in the template for clinical trials? For unit costs, the EC foresees different cost levels for different beneficiaries (see table in the template you are referring to column 3 & 4 + example provided in the table). While the total amount per unit can vary between beneficiaries of a consortium, the estimated effort (e.g. time of a doctor spent per unit & amount of resources used per unit) must be the same for one trial, study investigation. And what about costs of hospital care that we as a clinical trial sponsor have to pay? Costs for hospital care that are paid through the national healthcare system/covered by health insurance cannot be charge to the project. Any costs for managing the patient that incur only due to the implementation of your project can be listed in the project budget. How to calculate unit costs if the trial is a new process (was not carried out in the past)? You would have to estimate as good as you can, based on information that is available and that has been recorded in the past. For example, even if that specific clinical trial has not been implemented at your site yet, you should be able to estimate the amount of time that your staff will spend per patient, and use the personnel costs from the last recorded year to calculate the personnel cost per patient included in this new study. All other components, such as consumables etc., should be calculated similarly. For a given consortium, can one beneficiary use unit costs and another real costs? How are the unit costs audited and on what extent the details must be identifiable in the accounts of the beneficiary? How are the unit costs audited and on what extent the details must be identifiable in the accounts of the beneficiary? In other words, can we include in the unit costs that are usually used by hospitals, based on a national tariff system? - they must be necessary for implementing the action & identifiable and verifiable, in particular supported by records and documentation. In the scope of PHC14: How detailed should be the submitted budget in such a case? In the scope of PHC14: as the clinical development is depending on the data that will be obtained in preclinical studies, it will be difficult to have a precise budget to submit. How detailed should be the submitted budget in such a case? How detailed must be the study information that we will submit to H2020? Can costs for the experimental drugs be regarded as consumables? Study medication I personally would put under "other direct costs", but NOT to use in the "unit costs per patient". With the study medication, you have some more steps to get funded: packaging, blinding/ coding, maybe even (GMP) manufacturing. Overall, I would put it as bigger tasks than just as "consumables". For the Certificate on Financial Statement and an audit by the EC, I assume that the beneficiary should be able to specify the unit costs with actual and auditable costs (which origin from the year in which the application was written)? In other words, it cannot be a ballpark figure? No ballpark figure, no. Numbers must be based on actual costs recorded in last closed accounts of beneficiary, described in detail in the full proposal, and will be assessed by the evaluators. Any costs that will be reimbursed by health care providers/ insurance are NOT eligible for funding via the EU project. Can unit costs be used for linked third parties even if the beneficiary they are linked to does not use them? Yes - they would have to be defined for that linked third party specifically in any case. In another NCP presentation it says that it gives an exception to this rule for clinical trials - use of unit cost for in kind contribution...? Is the discussion ongoing or does it give a clear written statement on that? It is possible to include study centres as 3rd parties providing in-kind contributions against payment. These third parties need to document their costs in the same way as beneficiaries (actual costs or unit costs). Please also see question 8 under “Consortium / Partners / Third Parties”. How much detail on the background of the study should go into the clinical study document? As much as necessary to understand why the study needs to be done. The template does not specifically ask for scientific background. But you need to describe the background under Concept & Approach in Part B of your proposal. Does the content of the description (Part B) have to include the same details as the ones described in the template? You should use the template as a "checklist" to make sure you cover all relevant aspects. All relevant information needs to be mentioned in the proposal body (Concept & Approach; Part B) in those cases. Is it possible to just give a few information on the CT in the file that we submit, as our clinical development will be conditioned by the preclinical data that we will obtain? Yes, you give as many details as you are able to give at that moment. The later the CT will happen, the less details you will know at the time of application. Evaluators need to be convinced, nevertheless, so at least give a vision of your idea. Is part 4 used by the experts for evaluation, or do they have to disregard it (only to assess the capability of the consortium). Evaluation criteria are applied for chapters 1-3 only. As I mentioned, I would put as much info as possible into the chapters which are not page limited, but you should of course MENTION them in chapter 3 as well (and make reference to the extended versions). 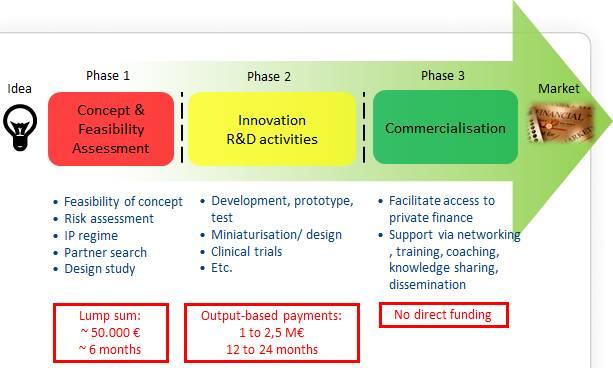 "Official reporting in H2020 is every 18 months" - what if the entire duration of the proposed project is 18 months? In that case you have only one reporting period. Are there any guidelines on satisfactory number of participants for clinical trials on medical technology? No, there are no guidelines on that. You should include as many participants as needed to successfully conduct the CT / project. So it totally depends on your project. If we only work on the collection of samples is that it falls within the principle of a clinical trial? Any work related to the observation of, data collection from or diagnostic or therapeutic intervention on patients is defined for the purpose of using the template and thereby is a CT.
At the stage of the application, documents like informed consent form, information sheets, ethics approvals etc. are not available yet. These will often be established during the project. How should one deal with that? Say as it is – we have this, we are here, but xyz is not yet precisely projectable. Based on the points made about time planning would you expect the duration of a project including clinical trials to be longer than those under FP7, for example, 6 years instead of 5? Do you think this will be accepted by the Commission? With regards to “realistic” 6 years might be better than 5 years – so you need to argue accordingly. With regards to credibility and manageability – I would not recommend to prolongate the projects too much. The longer a project is, the more may happen meanwhile which affects results etc. You might rather consider to leave out 1 or 2 Work steps and make the project more tiny and focused. If we only make hydratation measures (non invasive measures) of the skin following the application of cosmetics, does that it fall within the principle of clinical trial? For the purpose of the Template, a clinical study is defined as any clinical research involving a substantial amount of work related to the observation of, data collection from or diagnostic or therapeutic intervention on multiple or individual patients. It includes but is not limited to the clinical trials in the sense of the EU Clinical Trials Directive (2001/20/EC). So according to this definition would be regarded as a clinical trial. Collecting data from or diagnostic or therapeutic intervention on multiple or individual patients is considered a clinical trial and the template needs to be submitted. If you are not sure, if your work would be considered a CT, we recommend to fill in the template to be on the safe side. Could you please briefly restate the importance and role of the TEMPLATE? The template for essential information on clinical trials is mandatory at stage 2 (full proposal) for projects addressing all topics marked with an asterisk in the slides (slides are available on the FFH2.0 website) or indicated on the template. If our project foresees a clinical trial to be performed in 4 different enrollment centers across Europe, how many templates should we fill in? You are supposed to fill in the template for each study, no matter how many study centers will be invlvoved in one study. If you have 3 Studies included in your project, you'll have sections 1-9 filled in for each of those (1.1, ...1.9; 2.1,...2.9 ....), please remember to upload everything as one single document. In the case of multicentered clinical trials, is there one document or one for each pilot? There is one template consisting of 9 sections. All sections have to be completed for each study of your project. So there will be one single document to be uploaded containing information (section 1-9) for each study. Must the template for clinical studies be uploaded together with Part B (included) or as separate PDF in the PPT? Is the compulsory annex also used for the evaluation, e.g. : we do not have to repeat what we said, to cut down the number of pages? What level of information is expected at stage 1? Annexes are to be uploaded with the full proposal, and yes, accessible for the evaluators. You do not have to repeat everything in the proposal body, but can be more concise there and make cross references to the annexes. In stage 1, you must be very brief, as the overall page limit is the same for all proposals, including those that entail clinical study elements. How/where do you use the protocol in the H2020 application? There is a specific appendix in H2020 about the essential information on clinical trials. How does this relate to the protocol? Some of the information that is part of the protocol will also appear in the proposal body at places where you describe your study. The protocol as such can be included in a draft version as part of the extra documents that are to be uploaded. The final protocol does not have to be part of the proposal. Where can I find „Health“-related topics in the new Horizon 2020 Programmes? In addition, see all the open calls of Marie Sklodowska-Curie actions (MSCA) and European Research Council (ERC) grants for individual researchers of any nationality and research teams. The MSCA grants include opportunities for companies and SMEs. The MCSA and ERC grands are not restricted to specific topics. What means Horizon 2020 and what are the main opportunities for SMEs? What means Horizon 2020 and what will be the main advantages for me as an SME? You can find a detailed description about the participation in the new SME-instrument, in the collaborative projects, as well as information about access to Debt and Equity Financing in the Participants portal. Do we have equal chances to receive phase 2 by applying directly compared to someone going through phase 1 before? The Commission would like to give higher chances for phase 2 applicants, but of course this depends on the number of applicants. SMEs that have gone through phase 1 first MAY have some advantage when applying to phase 2 - as the Commission likes to have SME go through all the phases (make it properly). Can these phase III trials have a much higher real budget versus money requested from the EC (max 3 million)? A complementary funding is not excluded in the work programme. Should the costs for Phase 1 be shown in the final report? What is the hourly rate of internal hours in phase 1? The commission does not ask for financial details, so no hourly rate; just try to reach the 71,000 euro (of which the 70% will be reimbursed as the lump sum). Are the 50.000 EUR for subcontracting or for internal personal costs? The 50.000 EUR can be used for any kind of activity (personnel costs, subcontracting, costs for patent search etc). When will the lump-sum for Phase 1 be paid? The lump sum will be paid in two portions - 40% with project start, the rest afterwards, at end of project. The projects that you might get financed as phase 1 and phase 2 are seen INDEPENDENTLY. How extended should the CVs be? Is a 5-6 lines summary sufficient? For the section 4 talking about the members of consortium, there is no page limit; but for sure you should not go too much into details - and only list experiences relevant for your proposal. Try to be precise and to the point. No, the feasibility assessment in phase 1 is addressing activities like risk assessment, description of bottlenecks, market study, user involvement, IP regime, partner search etc. Clinical studies are activities planned in phase 2. What is the definition for a Known biomarker? What do you understand by drug biomarker? How do I need to interpret the and/or in the Health call? How we should make sure that an evaluator does not have to see our proposal because of confidentiality reasons or competitive reasons? During the submission process you can name up to 3 people (companies) you wish to exclude; honestly, I would also write it on the cover page of part B. How many evaluators are there / application? At least 2 evaluators are planned to evaluate a proposal. How can we become a member of the coaching pool? Is the pool of experts for coaching defined until 2020 or still open for submissions (and if so how)? EASME is working on a database that is not ready yet. EEN will be included in this. Do we know already how/who will provide the complementary business coaching? Business Coaches are selected from a pool that is offered by the EC. You will select one of them based on his/her expertise, as of course there are specialists in the particular fields that can assist you. Together with the coach you will work on a coaching plan for phase 1 and coaching will be important also to help you in preparing the application for phase 2. This procedure is intended to be accompanied by the Enterprise Europe Network (EEN). How can I advertise my expertise as a partner to larger research organisations/ research projects? SMEs definition involves several criteria. You can test them and see detailed explanation of SME-definition on http://flt.uwe.be/ . This site will allow you to answer an easy question: am I an SME or not ? Which companies will be partners for these two topics in Call 1? For topic 1 and 2: Sanofi (Coordinator), Novo Nordisk (Co-coordinator), Eli Lilly(To be confirmed), Other potential partners are still under consideration. Are there ongoing project on personalised medicine and reduction of costs? What will happen with RADAR? It has been taken out of call 11. Can we have an idea of when it will be published? The RADAR topic is still under discussion between the industrial partners in order to ensure the involvement of other industrial sectors such as the imaging companies. Was the subject Multiple Drug Resistance (MDR) treated up to now? The proposers within IMI2 should be at least 3, each from a different country? I am in the staff of a university hospital that is looking to increase participation in European research programs. Do you have information on which SME from Italy participating in IMI projects in the health sector? Will IMI funding be applicable for covering costs associated with preparation of an EOI (expression of Interest)? Are there further details/examples of clinical trials funded through IMI? Are there funds available for human clinical trials in Call 9? Can a research organization use IMI funds to contract a clinical trial with a Clinical Research Organization? Management depends on the complexity of the project. Management can be much more detailed in difficult phases of a project. As a co-ordinator one of your tasks is to follow the progress of your project to avoid undue delays. Especially in the first phase of the project you need to monitor the people if they are on the right track. Delays in critical tasks will trickle down and have an effect of the entire project. The focus of all partners in a project has to be on agreeing on objectives. As a co-ordinator you have to pay attention that the partners deliver their reports in time. Delays in reporting leads to a delay of the interim payments for the whole project. How does the justification of hours worked on a FP7 project to be documented? Are time sheets required? Not necessarily. When you have a consistent, high-quality documentation system you can convince your auditor to take this instead of time-sheets. But time sheets are default for most of the organisations, because they are easy to handle. The time recording needs to be signed and countersigned by either the project leader or the hierarchical supervisor. If the time recording system of your organisation is able to do this (e.g. by electronic signatures) then there are no time sheets needed. As the most organisations do not have such a system it is best to print out and sign and have counter-signed the time sheets on paper. Is the coordinator of a FP7 project responsible for the money spent in the project? Each partner is responsible for the costs in the Form C and has to keep the documentation in its organisation (including the co-ordinator). But if a partner exceeds the amount of money he is allowed to spend it is the responsibility of the co-ordinator and the management board to monitor that. The co-ordinator is responsible for a good conduction of the project as well as for all the payments to the partners. Can you please tell me what the situation is with reporting in FP7? One of our deliverables should already be completed by Month 5 which has just passed. I have the information for the report. Should this be uploaded and submitted online now or can we wait for the reports of the 1st reporting period, after 18 months? 1. The deliverables identified in Annex I to the Grant Agreement, according to the timetable specified in the Deliverables list. Guide for Applicants Health Theme: Please note that each deliverable will have to be submitted as a distinct document/report. In order to keep your deliverables manageable, small related deliverables should be grouped as specified parts (equivalent to 'subdeliverables') of a single more substantial deliverable. Progress towards achievement of the full deliverable can then be demonstrated in the periodic reports by reference to the smaller parts. The full deliverable will only be submitted when all parts have been -completed. Ideally this will be at the same date as a periodic report. When do I have to provide a certificate on financial statements in a FP7 project? in FP7, every partner who receives more than 375.000 EUR or exactly 375.000 EUR funding has to give a certificate on financial statement (CFS). Together with the financial statement (Form C) which reaches the threshold of 375.000 EUR, the CFS has to be submitted. E.g. in the first period you receive 200.000 EUR funding – you need no CFS. In the second period you receive another 200.000 EUR funding – now you reached the threshold (as 400.000 EUR is more than 375.000 EUR), therefore you have to bring in a CFS. In the next (last) period you receive another 200.000 EUR funding – you don’t need a CFS as you don’t reach the threshold anymore. If you receive less than 375.000 EUR funding in a project, you don’t have to bring in a CFS at all. In projects with less than 2 years if you receive more than/or exactly 375.000 EUR funding, you only have to hand in a CFS at the end of the project. (The same is valid for organisations with a valid Certificate of Methodology, they don’t need a CFS for interim payments, just one at the final payment if they get >= 375.000 EUR funding). Costs for CFS can be reimbursed under Management – Subcontracting. My question is in relation to direct and indirect cost in FP7. If we allocate some of the time of the Director of the Research Centre, where do we allocate this cost? As direct costs or personnel costs? Here it depends if the Director receives a salary or not. If the Director does not receive any salary the Marie Curie rates can possibly be taken. Otherwise there has to be made the distinction if his salary is completely in the overhead costs (indirect costs). If so and he wants to get reimbursed hours in the project, these hours have to be taken out of the indirect costs and booked under the direct costs – only then these costs can be reimbursed under personnel costs. I just add here that a complete time recording for the Director is needed too. In FP7, any double funding (e.g. national funding) is forbidden, isn't it? Yes, it is forbidden. Only complementary financing is allowed.